Gavan Barrie Scottish Government, Minister Geoffrey Boot MHK Isle of Man, Hannah Blythn AM Wales, Minister Denis Naughten TD Ireland, Lord Gardiner UK, Sarah McGreevy Guernsey, Deputy Steve Luce Jersey, Denis McMahon Northern Ireland. 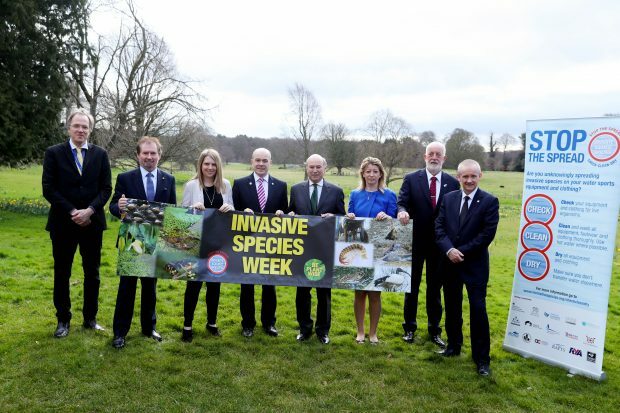 Today marks the start of Invasive Species Week (23 – 29 March), a campaign to raise awareness of the dangers posed to the UK’s wildlife by non-native plants and animals. Biosecurity Minister, Lord Gardiner, is in Dublin chairing the British-Irish Council and will host a discussion with the Irish Environment Minister and representatives from the devolved administrations in Northern Ireland, Scotland and Wales and representatives of the Isle of Man, Jersey and Guernsey on this topic. The British-Irish Council (BIC) is designed to promote further cooperation across the British Isles on tackling this issue and other important environmental concerns. Keep an eye on our Twitter page, where we’ll be posting fun facts and quizzes throughout the week. 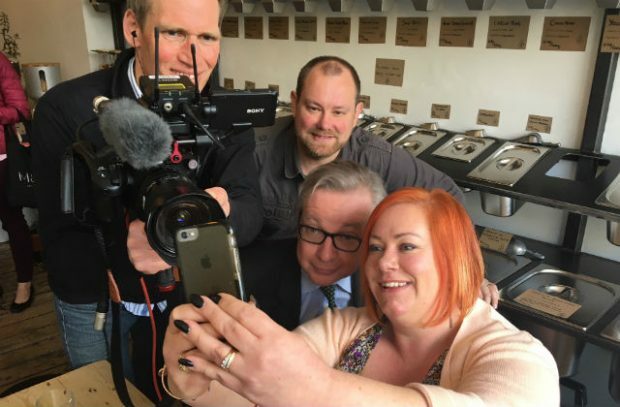 Environment Secretary Michael Gove taking a selfie with a plastic free family. On tonight’s BBC News at Six the Environment Secretary, Michael Gove, will meet a family from Bristol who have gone plastic free for 10 days. BBC News has been following the family across their plastic free challenge and tonight’s piece will feature the meeting in a plastic free shop called Hetu in Wandsworth. Andy and Liz Evans said they had found it difficult to avoid buying items wrapped in plastic in supermarkets, but they had found success with refillable milk from a local farm and vegetables purchased in a box. Watch the full report tonight and see how Liz Evans got a selfie with Mr Gove. We all have a vital role to play in driving out avoidable plastic waste, and with businesses, customers and suppliers collaborating to eradicate avoidable plastic waste, we can ensure we leave our planet in a better state than we found it. There has been coverage today in the Farmers Guardian on the experiences of farmers who are currently waiting to receive their BPS payments. The Rural Payments Agency is working hard to provide BPS payments to farmers as soon as possible. We know that delayed payments cause problems to farmers who are working within the confines of the EU regulations on farm payments to process complex payments as quickly as we can. 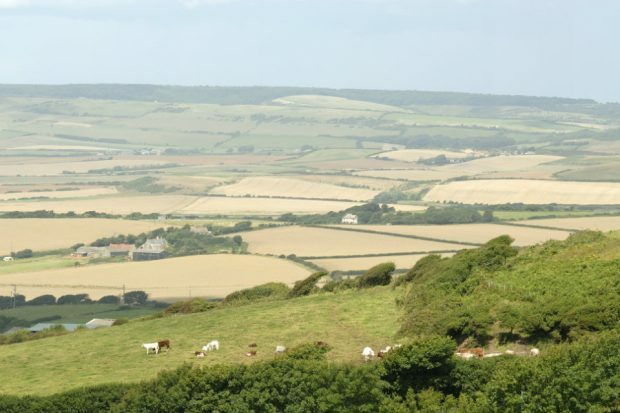 Leaving the EU will provide us with a golden opportunity to develop an agricultural policy that is suited to the needs of UK farmers for the first time in 45 years and we are having constructive conversation with farmers on how to shape domestic policy that works in real life. By the end of February 95.5% of farmers (more than 81,000) had received their BPS 2017 payments, worth £1.59 billion in total. As in every year, there are some claims in the pipeline and some that require more complex processing so take longer to complete. Any farmer that does not receive a payment by the end of March 2018 will be provided a bridging payment in early April. Media reports today following the announcement of a £260million Clean Air Fund have covered a claim by Greenpeace that the government has dropped plans for a national scrappage scheme for diesel cars as part of our plans to address roadside emissions. This is reported in The Sun and by the BBC. This is incorrect. We have always been clear that any potential scrappage scheme would need to be targeted towards those that need it most. 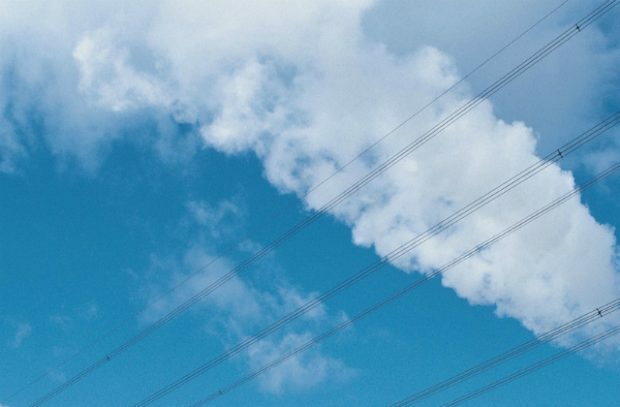 The Clean Air Fund announced today specifically includes targeted scrappage schemes as one of the possible uses of the fund that local authorities may wish to bid for. Councils will need to demonstrate that any scheme would effectively reduce NO2 emissions and won't waste taxpayer's money. Since the government published our UK Plan for Tackling Roadside Nitrogen Dioxide Concentrations, we have seen a number of car manufacturers come forward with nation-wide scrappage schemes for older diesel vehicles such as those including Audi, BMW, Ford, Hyundai, Kia, Mercedes-Benz and Peugeot. It is wrong to claim that we have changed our position or ruled out scrappage. We have consistently said that any potential scrappage scheme would be targeted. Today’s announcement confirms this position, making it clear that councils with poor air quality can put forward plans for local scrappage schemes under the Clean Air Fund.